I love making Halloween cards not that it is really a holiday where you send people cards, but I just think it's fun. However I didn't get to make very may this year because of life and other creative obligations, but all is good. I did make a couple and wanted wish you a Happy Halloween by sharing them with you today. I decided to use some of my paper pads that I tend to hoard. I used the outside in scalloped rectangles from Lawn Fawn to cut out my rectangles and layer them. For the spider web paper I inked the edges with twisted citron distress oxide ink to create a cloudy glow. I cut two pumpkin tags from orange cardstock and black glitter cardstock using the Lawn Fawn fall tiny tags. I used the face also included in that set to make the top tag a jack-o-lantern. I tied the tags onto the front scalloped rectangle with some candy corn lawn trimmings. I used Happy happy happy as well as the add-on set to create the sentiment. I used black embossing on yellow cardstock for the 'happy' and cut it out with the coordinating die. 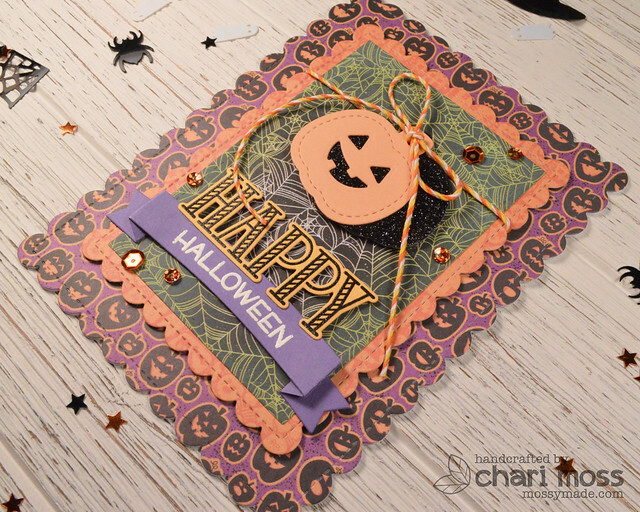 I used the new Lawn Fawn white embossing powder for 'halloween' on a fancy folded banner. For my second card I tried out Distress Specialty Stamping paper for the first time. 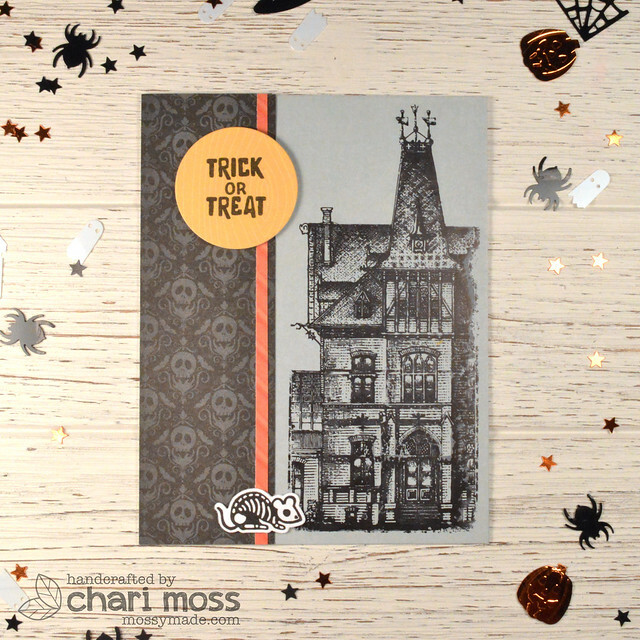 I blending on some Hickory Smoke distress ink then stamped the house from Tim Holtz Regions Beyond stamp set using archival ink. This paper picks up the details of this stamp perfectly. 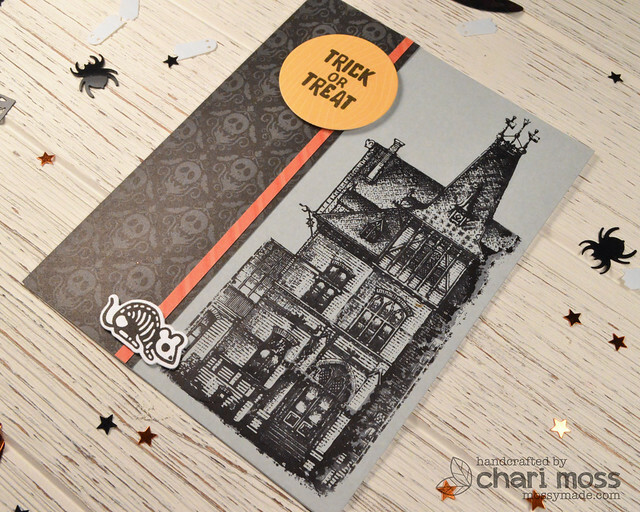 Since the house image is very large and detailed I wanted to just add a little something to the left side and to finish the card so I added some pattern paper from one of the again many paper pads I hoard. I inked the edges of the black pattern with some black soot ink to define them a little better. I added the thin orange strip to bring in a touch of color and the sentiment I stamped on a circle of yellow pattern paper to look like a moon. I felt like it needed just a little something more so I added the little skeleton mouse from Newtons' Nook Spooky Skeletons set. I hope you all have a Happy Halloween! Thanks for stopping by! 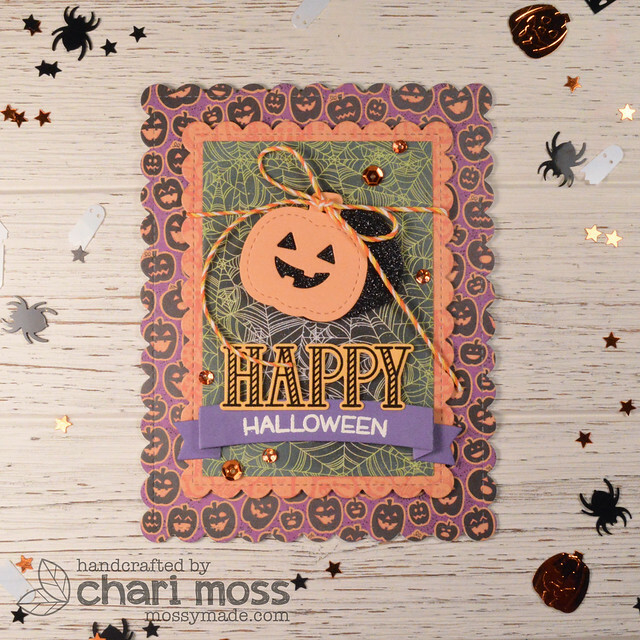 These are two great Halloween cards !